The image of a bat with spread wings in bas relief on a sterling silver shank. The Ouroboros, is an ancient symbol illustrated by a serpent swallowing its own tail, forming a circle. A simple shank ring with the anchient Goddess Doni; her arms over head and a spiral on her belly. The disc of the full moon on a solid shank of silver. Tongues of fire forming a five point star surrounded by a firey circle, mounted on a shank of sterling silver. Two ropes combined are stronger than the single cord. A metaphor describing how a couple commitment may strengthen each others lives. A ring made in the spirit of Peace, the traditional symbol popular in the 60s. A Ring of the Horned One, The God's face framed by beard and deer antlers depicting the image of Hern of the wild hunt. The Face of the Goddess sculpted on a disk in bas releif. Her hair surrounds her countenance giving a radiating effect. A detailed Wolf Face looking at you with curiosity, the mane of his head trails into the shank of the ring. A new and more detailed Ouroboros ring, this is the classic Ouroboros swallowing it's tail. Two ropes combined are stronger than the single cord. This is a traditional version of the Lover's Knot. One of my earliest creations: Moon and Star Ring. The Peaceful Mushroom Ring is a Peace Sign composed of five Amanita Muscaria. Lady Centaur pulling a bolt back with her bow: she aims for the stars. 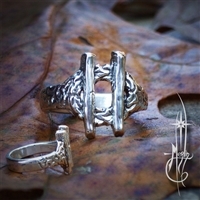 A classic Sagittarius ring The top of the piece holds the Rune of Protection. The sides of the ring are flanked with the waxing and waning moon. In it's best aspect the Maple is a tree of Health, Longevity drawing helpful and positive spirits and energy. A ring that symbolizes the eternal. The center glyph is a spiral representing the Tor of the Grail. The sides are adorned by Triquetras The Awen ring symbolizes Sky Father Energy in balance with the Earth Mother energy as well as any of a thousand other sets of three ideas This is a winter version of the Awen Ring: a wreath of leaves and three staves descending from the top, the leaves are of Holly, the "dots" are pine cones. Sometimes when you look up into the forest's branches, one can see images like faces in the leaves. In the elder days, that "face" was said to be a vision of the Green Man.